According to EPA 1664 B, the O&G-HEM test (or Oil and Grease n-Hexane Extractable Material) is an extensive test that requires various amounts of equipment and time. However, the test does not have to be difficult as long as the necessary precautions are taken. This method is used to determine the amount of n-hexane extractable materials that is retained on a filter from an aqueous matrix. After the sample is pH adjusted, we pour it through a specially designed filter to collect the material. The leftover material is to be extracted, dried and weighed to give a final value. MAKE SURE THIS TEST IS PERFORMED UNDER A HOOD!! THE FUMES ARE POISONOUS!!! 1. It is best to bring all samples to room temperature before the test analysis begins. Basic chemistry tells us that the liquid samples will contract when they are exposed to cold temperatures, bringing them to room temperature insures that the samples have the same volume as they were when originally sampled. Remember to pH check the samples too, they should still be below a <2 from the preservation of the sample. If the sample is not below <2, add a drop of sulfuric acid (6N) to the sample to bring the pH down. 2. Set up the manifold system. Refer to your manifold’s manufacturer instructions. 3. Place one disposable filter between the orange fluorosilicate gasket and manifold. (Only use one filter per sample!) Connect the clamp to the cup and manifold to insure there is no leak. Attach waste flask (make sure it is not the collection flask) in the collection position. 4. Most importantly, mark all the sample containers with a marker to show sample level. Later we will reuse this line to measure how much sample was used. 5. Turn on the vacuum pump! Time to collect some Oil and Grease. 6. Rinse the filter cup with hexane. The hexane should drip into the waste flask. Before continuing, make sure all hexane has dried in the waste flask. This should take roughly 2 minutes. Turn the stopcock to the off position. Now that we are sure there are no contaminants in the filter from manufacturing, we can begin conditioning the filter. First, add 10 milliliters of fresh methanol to the filter. Then, quickly allow a small amount to go through the deposit filter line. (On most manifolds, the stopcock will go to the back, or clockwise) We do this to make sure that the methanol has coated both the top and bottom of the filter. Let the methanol sit for about 2 to 3 minutes. 8. After the 5 minutes has passed, turn the stopcock to the off position. Replace the waste flask with the fresh collection flask. Remember to mark the flask with a number or letter to tell the other flasks apart. 9. Take the original sample container, add 16 milliliters of hexane, then swirl it around with the lid tightly on. Make sure that the lid is opened periodically while swirling as the hexane will cause pressure to build. Pour the hexane into the filter cup. Turn the stopcock to the collection position (forward or counterclockwise for most manifolds) and allow a small portion to go through, then back to the stop position. Wait 1 minute to allow the hexane to soak the filter. After 1 minute has passed, allow the hexane to drip into the collection flask completely. 10. 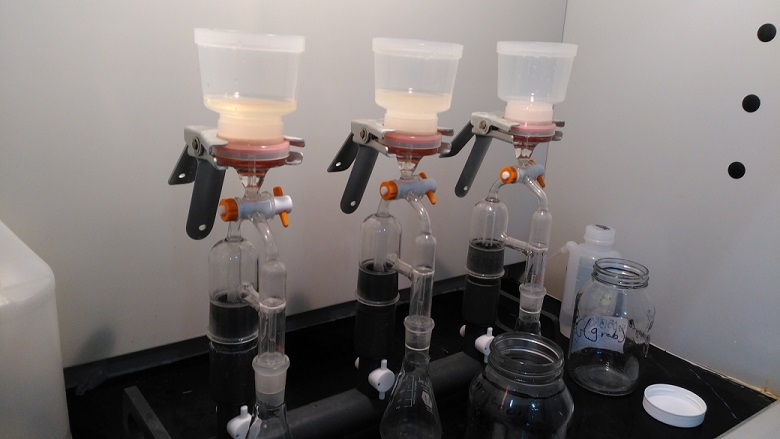 Repeat ‘Step 9’ two more times, rinsing the sample container with 15 milliliters of hexane each time. 11. Rinse the sides of the filter cup with hexane to make sure all Oil and Grease has been collected. When finished allow the filter to air dry for 2 minutes. 12. Now that the separation stage is at its end, we can turn the manifold vacuum off and disconnect the collection flask. Make sure to cover the flask with foil for the future evaporation stage. 13. To clean up, remove and discard the filter cup. Rinse all glass filter parts with hexane. Set up new filter cups and continue filtering samples as in ‘Steps 6 through 12’ until all samples are finished. 14. Take the original sample containers and fill them with regular water to the marked line that was made earlier. Measure the water with a large graduated cylinder (at least 1000 milliliters) to give you the exact volume of the sample. 16. Set up the new filter funnel with 5 grams of sodium sulfate inside the filter paper. Place the weighed number pan below each funnel. Carefully pour the sample from corresponding collection flask through the filter into numbered pan. Squirt and swirl the collection flask with hexane 3 times. The sodium sulfate will collect all moisture from the flask, leaving only the hexane and O&G in the pan. Make sure to rinse the powdered sodium sulfate. 17. Put the QuikVap plate under the hood with the samples. Turn the heat to 65C° and adjust the nitrogen purge. (Nitrogen and heat will accelerate the hexane’s evaporation). Then transfer the aluminum pan full of hexane onto the QuikVap. Near the end of the evaporation, there should be crystals, drops of oil, and other crud in the pan. This means that you have successfully collected the sample. Congratulations! After the pans are completely dried, place them in the desiccator. It is best to leave the pans in the desiccator for at least an hour, but can be left overnight. 18. After the pans are finished cooling in the desiccator, weigh them for their final weight and record it. If the test requires SGT-HEM (or Silica Gel Treated-n-Hexane Extractable Material) rather than Oil and Grease there is only one step that needs to be included. Silica Gel extracts a special oil that the original test would have measured. After Step 18, the recording of the final weight, add a sufficient amount of n-hexane to the aluminum pan to dissolve the residue. Then add 3 grams of silica gel for every 10 mg of HEM in the sample. (This can be achieved by doing the calculation on Step 19.) Make note of any silica gel addition greater than 3 grams. After the silica gel absorbs the residue, dry and reweigh the pans in the same fashion from Step 17 and 18. ETS wants to wish all of our blog readers a HAPPY NEW YEAR!! And what a great way to bring the new year in with the University of Alabama’s championship winning football game! ROLL TIDE! Along with our full service environmental and fuels testing laboratories in multiple locations, experienced and qualified sampling technicians, excellent service and competitive rates, ETS can resolve all of your technical and compliance needs, so you can move on to the more important new year resolutions on your list! Contact us today with any questions you may have concerning this information. ETS looks forward to working with you! ETS has recently acquired an ICP-OES Spectrometer. What does this mean? While ICP-OES is actually short for an inductively coupled plasma optical emission spectroscopy, in short it means that ETS has improved its method for detecting trace metals for the environmental world. 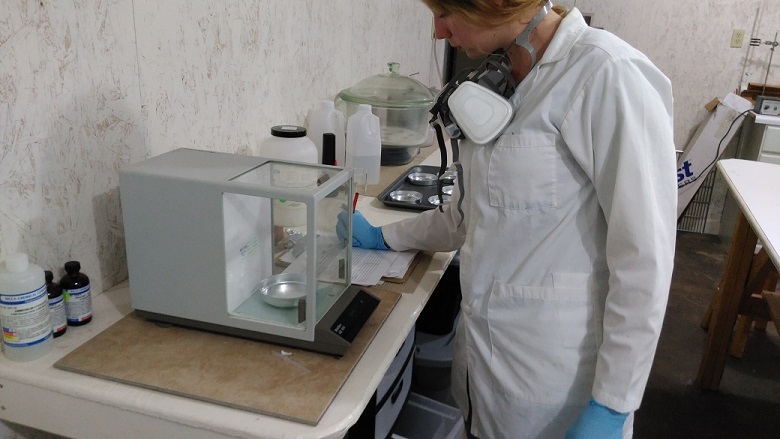 The ICP-OES is ultra-sensitive to the analysis of trace metals, which means it has the capability to read detection limits at extremely low levels. 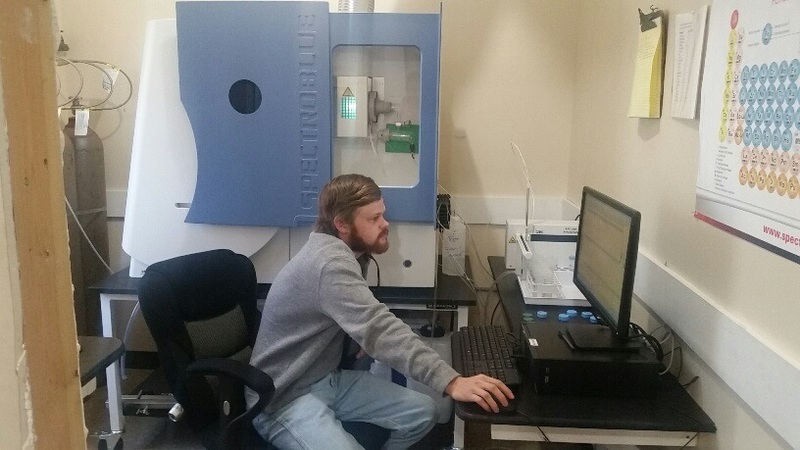 For example, our ICP-OES can read any metal it analyzes at levels of 0.005 ppm, or 5 parts per billion. These amounts are extremely small, but some materials can be dangerous even at such low levels, which is why environmental agencies want to test for certain substances in water. The ICP-OES can also read interferences from other metals in the axial and radial views. This means the ICP-OES can read through the plasma it uses for detection through two different views, vertical and horizontal. This gives a more accurate result. 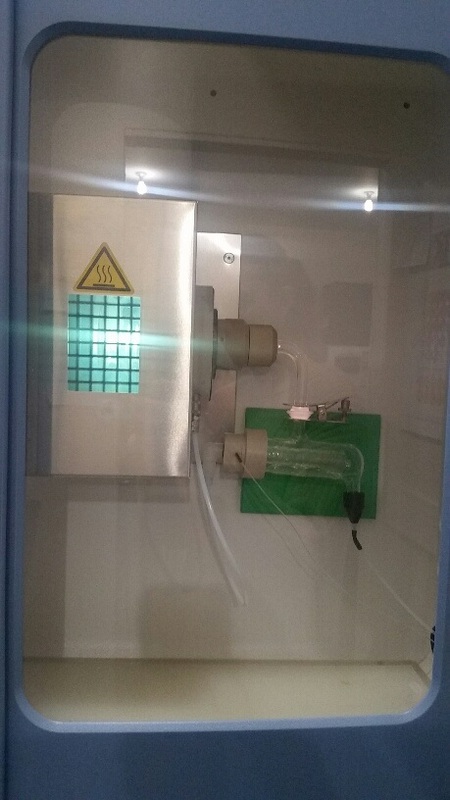 Although it is hard to capture on a photograph, above is the plasma that ICP-OES uses to analyze metals. 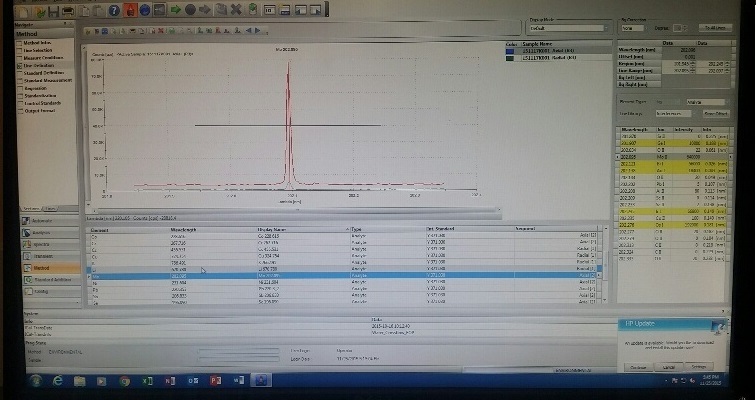 Another aspect of the ICP-OES is that it leaves minimal room for human error once the analysis starts. Everything about the analysis, excluding the prep and digestion, is computerized. 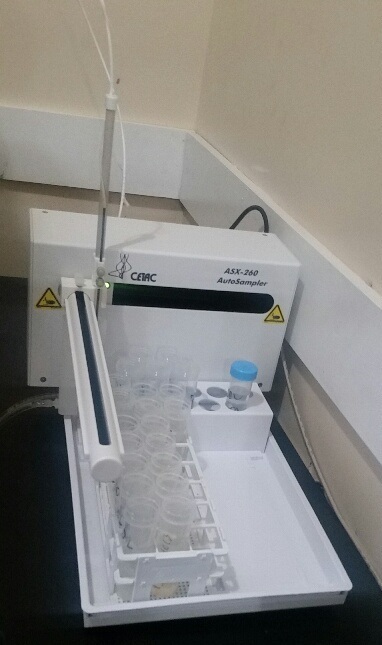 This is the autosampler that the ICP-OES uses. The ICP-OES comes with state-of-the-art software. ETS employees spent a week training and preparing to run the ICP-OES software, and know everything inside and out about the ICP-OES. Quality assurance and quality Control are made simple with the ICP-OES. An example showing the software that the ICP-OES uses. The above photo shows a sample that has a spike in a certain metal. ETS is here to serve your environmental needs. Please give us a call if you have any questions about the ICP-OES for metals analysis, or any other analytical issues. 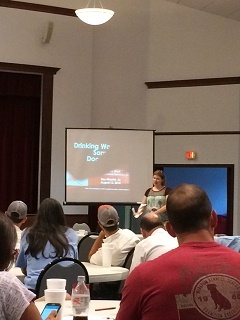 A free drinking water class was held in Bay Minette, AL at the Bay Minette Civic Center on August 13, 2015. The class was sponsored by ETS and HACH Company. 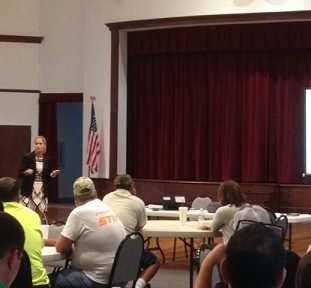 Six hours of CEU's were available to attendees. 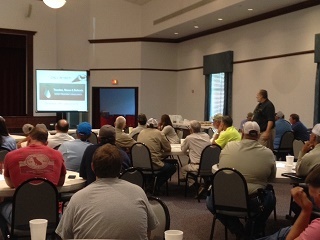 Over 55 operators from 17 different water systems participated. 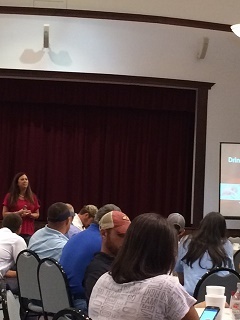 A special thanks to North Baldwin Utilities for the use of their facilities and to HACH and ETS for providing lunch for everyone who attended! 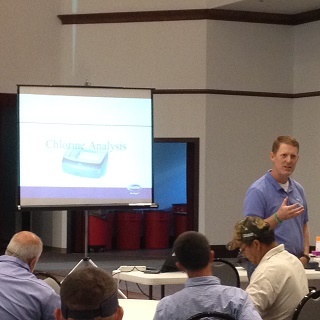 Jason spoke about basic chlorine analysis and new technology for field testing parameters. Chavon's presentation included drinking water regulatory updates, including Total Coliform Update Rule and the new eDWR reporting. Suzanne discussed laboratory ethics in both testing and data reporting. She gave specific examples of incidents where someone went to jail because of this. Laboratory ethics include moral and legal implications, and any unethical instances should not be taken lightly. Bernard spoke about a case study in corrosion control. He also presented the group with an experiment at each table. 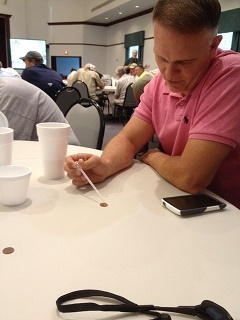 How many drops of water can you put on a penny before it spills off? Over 45 drops! Who knew? 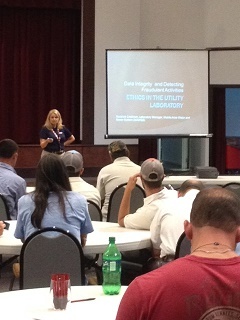 Lennette's presentation was about correct drinking water bacteria sampling and documentation. Shannon spoke about using hydraulic modeling for a municipality and all the other uses from it, including water loss studies and flow issues. Julie was a wonderful host and did a great job of making everyone feel excited to learn new things about drinking water! 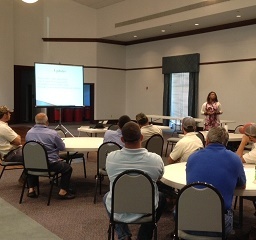 Do you or your company have any questions or issues regarding the information presented at this drinking water class? Do you feel like you missed out and need additional training about drinking water? Give ETS a call! ETS provides businesses and municipalities training classes throughout the year to help you understand this industry in the best way possible! Call 205.330.7994 or email info@energytechsvc.com for more info. Have a lovely day everyone, and don't forget all the hard work and responsibility that goes into being able to drink the water from your faucet! This blogpost was written by Lacie Atout. Here at ETS, one of our biggest concerns is employee safety and protection. ETS tries to accommodate our employees to keep them out of harm’s way at all times. This is important not only for ETS and its’ employees, but for ETS customers as well. 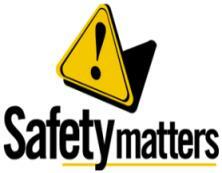 Safe employees means safe business procedures and practices provided to our customers for the best service possible. -Severe weather. Here in Alabama, tornadoes, heavy rainfall, and very high temperatures can be hazardous. There is no way to prevent bad weather, but precautions can be taken to try to offset the effects that the weather conditions, such as watching the weather channel, not driving in severe conditions, and staying hydrated in the heat. -Loud noise from machinery or equipment. Be aware of how many people are around and that no one is in the way of any heavy machinery. -Shock hazards, such as open electrical currents or circuits. -Working from great heights, such as the rooftop or a ladder. Keeping the work area clean. -Be organized and keep work areas clean. Knowing where supplies, equipment, and chemicals are and keeping them in a designated place is helpful for everyone in the workplace. -Clean up any spills or contaminates immediately. If a spill or a wet floor has to be left unattended, make sure a sign is put out for others in the workplace to see. -Do not leave trip hazards in the way of others. Extension cords, telephone cords, door mats are all potential trip hazards. -Healthy: make sure all employees are at an optimal health level. Getting an adequate amount of sleep, eating a healthy diet, and getting enough exercise are all recommended. -Hydrated: Especially in this Alabama heat, drinking enough water and fluids is so important. Providing employees with plenty of water at the workplace, and when on the road, is always a good idea. -Happy: It is important to make sure employees are comfortable. Talking and listening to employees’ concerns is a key part to providing a safe workplace. Also making sure that employees are not preoccupied, are focused on their job, and are not in a hurry with their duties is imperative. -Do not rush, remain calm, evaluate situation. -Seek help, whether it be emergency help or another employee, etc. -Sit/lay down until help arrives. Take deep breaths. Slow breaths in through the nose, and out through the mouth can sometimes be helpful. -Unless it is a heat related situation, try not to eat or drink anything until medically approved to do so. -If it is a heat related situation, sit in a cool area, and sip on cool fluids. DO NOT GUZZLE LIQUIDS. Guzzling may cause vomiting is overheated. -Do not move patient unless it is mandatory until emergency help arrives. Do you have any safety tips that you follow that are not listed here?Leave a comment!